I feel like having a bit of a moan this issue. I may be growing older and with it grumpier but I’m becoming less patient of the anti-SUP brigade. It’s beginning to wear on me, frustrate me, irritate and fatigue me. Why do so many people hem themselves into one chosen sport and then refuse to even consider SUP? Case in point. I live in Newquay with Fistral beach a five minute walk away. It’s a beach that’s always been heralded as one of the focal surf spots, not only in the UK but across the whole of Europe. Generally swell lines roll in on most days, there’s nearly always some surf kicking about and it’s never a long drive up the coast to find a bigger or more tucked in spot when it’s onshore and relentlessly blowing. Until that is, in the summer. For the past few years I can’t remember a summer when the surf hasn’t died off over July and August leaving us with balmy high pressure, blue skies and flat, tranquil glass-like ocean. During these strange, serene mysterious flat spells, the surf community of Newquay no longer jog their way through the golf course or through town with surfboards tucked under their arms. Surfers stand dispirited and adrift at South Fistral with binoculars trained on the horizon, a despondent forlorn cloud falls on everyone wearing boardies and sales of Sexwax no doubt dwindle enormously. When these flat spells come, normally for two or several weeks at a time, the number of people hiring or borrowing SUPS suddenly increases massively. When I say this, I mean relative to normal numbers, you’ll see approximately ten people paddling a SUP out at Fistral. As for everyone else who surfs, I’m not sure where they go or what they do. 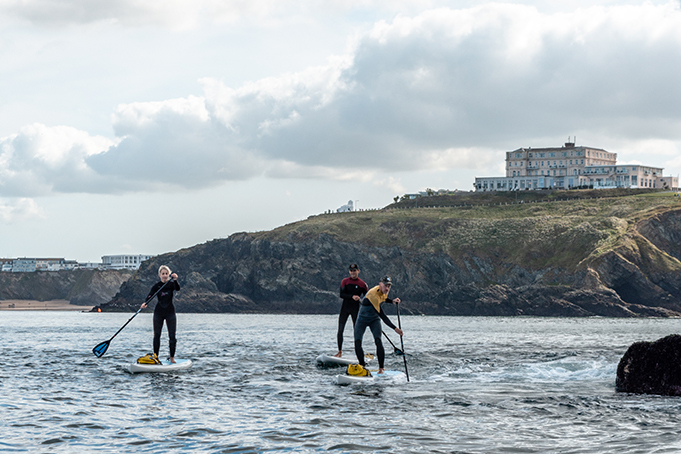 Even if just 10% of Newquay’s surf population hired or borrowed a SUP board, I’d hazard a guess that there wouldn’t be enough SUP boards in Newquay to go round. Generally, for a gentle potter about on a sunny day SUP’s got novelty value for most people. But after a few days, as soon as Magicseaweed shows a hint of a measly one star wave, SUP’s out the window and the surfboards come back out. I’m guessing for the majority they won’t even touch another SUP board until next July when the ocean lies flat again. Now I’m not saying that everyone has to like SUP. That everyone dislikes SUP. Or that everyone really has to go and SUP. If you don’t want to do it that’s absolutely fine. I’d also like to say that I’m in no way anti-surfing. I surf myself and love it and I totally understand that the freedom surfing brings over holding a paddle is a totally different feeling. However, it’s safe to say that there are a huge number of people who just don’t see the point in SUP and are actually pretty derogatory towards it when it comes up in conversation. This applies to people across all sports but I find it amazing amongst those who love any sort of water sport who clearly love being in the sea. It’s surprising that SUP never makes it onto their activity list when swell either is or isn’t on the forecast. Out back, any lone SUP-er who makes it into the line-up frequently gets eyeballed by a decent percentage of those in the water and very much paddles alone. 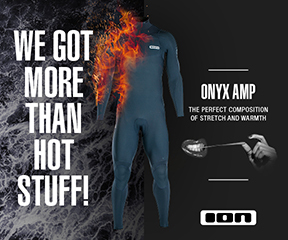 If you do any board sport and love being in or on the ocean why wouldn’t SUP make it onto your watersports repertoire? Why would you actively choose not to do a sport which gives you board skills which are directly beneficial and translatable to every other board sport possible? 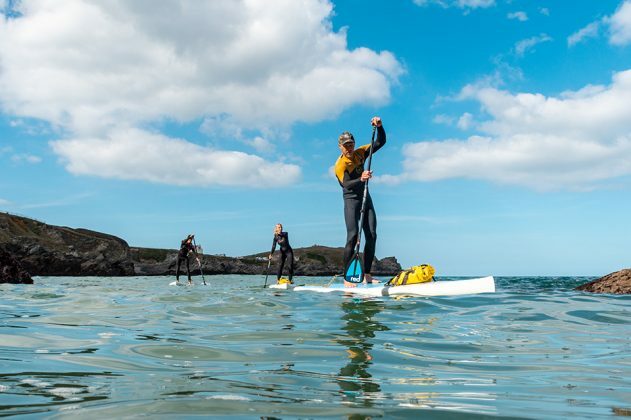 SUP gives you such great health and fitness benefits which will both directly and massively improve your surfing, windsurfing, kiting, wakeboarding or any other water based sport you can think of. Yes, you may love surfing more and yes, that may be top priority but why not tie in SUP more often to your general training or exercise routine? There’s a wealth of benefits which will compliment all other sports. This isn’t a vague or unsubstantiated claim. There’s some interesting and well researched evidence that supports SUP for all round health and sports performance. We should all have an idea of what diseases a sedentary lifestyle can lead to but to list a few it would include diabetes, osteoporosis, heart disease, stroke and cancer. The fact that we’re able to counter and try to prevent these diseases enables us to have a degree of control over our own health. If we leave the sofa and choose to be more physically active, you’ll find that physical activity of any sort significantly improves overall health, lowers the risk of heart disease by 40%, stroke by 27% and lowers the incidence of hypertension or high blood pressure by almost 50%. Physical activity has also been associated with improved mental health and well‐being, minimizing the risk of developing Alzheimer’s and depression. SUP is a great physical activity and can therefore help to reduce the risk of developing a multitude of lifestyle induced diseases. One study assessed a group of participants who embarked upon a SUP training programme. For six weeks, each participant SUP-ed for one hour, three times a week. To start with, participants were given longer, wider boards (~11’ length, 33” width, 4.6” thickness) before they progressed onto shorter, narrower boards (~length 9’1, 29.5”width, 4.4” thickness) to help challenge them further. The intensity of the SUP sessions was gradually increased until week three where high intensity sprint based training was introduced alongside long slow paddle sessions. Initially, participants paddled just one kilometre in an endurance session which increased to ten kilometres by the end of six weeks. 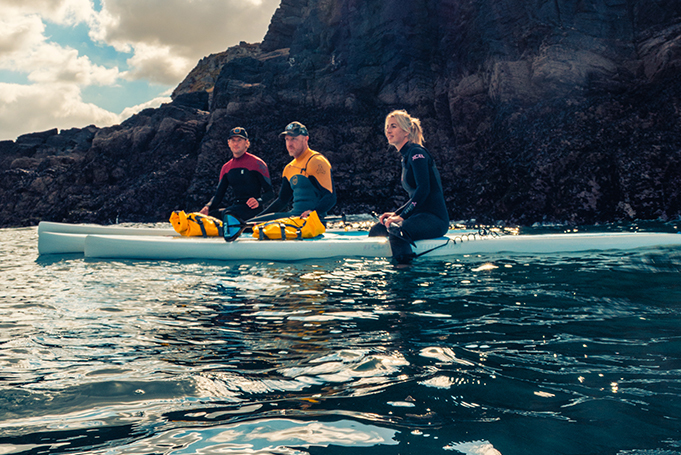 High intensity training initially involved bouts of two minutes of paddling, with ten seconds of high intensity paddling followed by ten seconds of rest. Over time, these ten second bursts were increased to five minutes in duration. Participants performed no other physical activity apart from their SUP training during the six week period. After six weeks’ worth of training in this way, the study found a significant improvement in aerobic power output, average stroke length and peak stroke length. One of the most significant findings was an improvement in VO2 max with an increase of 24%. This is a huge improvement in just six weeks. Other research has shown a 33% increase in VO2 max following a 12 week training period of high intensity walking and running three times a week, with a training maximum heart rate of 85–95%. Another study has shown a 22.3% increase in VO2 max over a 12 week training programme where cycling was performed three times a week at a low intensity of 60–80% effort. In comparison therefore to walking, running or cycle training, SUP demonstrates a similar level of VO2 max improvement and can therefore play a huge role in increasing aerobic fitness. At the end of six weeks, participants were able to SUP further and had increased their peak speed. Overall, the SUP training programme yielded significant improvements in aerobic fitness to the tune of a 20% overall improvement. On top of this, significant gains were also found in the anaerobic fitness of each participant, including anaerobic power, speed and distance. Anaerobic fitness increased by a whopping 42%. All sports, together with sports which primarily involve the upper limbs such as surfing and canoeing require a good degree of aerobic fitness. If you’re keen to improve your overall fitness, include both long-slow low intensity and high intensity interval training sessions when you SUP to help improve both your aerobic and anaerobic performance. Trunk muscle strength is important for a number of reasons. Multidirectional stability is required across all sports to help maximise performance and minimise the risk of injury. Trunk muscle endurance is greatly important to ensure that the trunk muscles remain strong and have good endurance to prevent them from fatiguing. If you have low levels of trunk muscle endurance it can lead to early fatigue which is a major cause of chronic back pain. To help train trunk muscle endurance, people often turn to a Swiss ball to help them. Studies show that a twelve week training programme incorporating Swiss ball exercises can increase trunk muscle endurance by 46%. What’s staggering is that six weeks’ worth of regular SUP training has been shown to elicit similar gains. If you were to SUP for longer than this, it’s likely that you’d increase the endurance in your trunk muscles even more than 46%. SUP is a dynamic sport which requires isometric contractions of your core muscles which can help to increase your overall core strength and stability. As SUP requires you to paddle on both sides, the muscle strength gained through SUP-ing can help to even out and overcome muscle imbalances across the body. This is in contrast to other sports such as outrigger canoeing where paddling is only performed on one side. Isometric contractions of the entire trunk, glutes and the lower leg muscles are also required during SUP to counter the rotational forces from the power phase of each paddling stroke. SUP essentially helps to strength you from your feet, all the way up your legs to the trunk, shoulders and arms. It’s a great way to globally strengthen your body with minimal impact. Standing and paddling on a SUP board can greatly improve both your dynamic and your static balance. 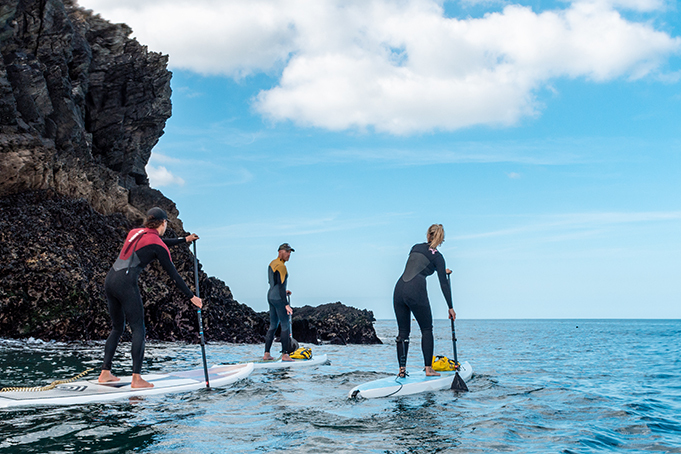 You can challenge your balance in a variety of ways, from switching from a wide to a narrower board, paddling in choppy versus flat water and SUP-surfing or down-winding instead of SUP-touring on calm seas. Improving your balance via SUP will massively benefit you if you do any other board sports such as surfing or kitesurfing. Even if you don’t do any other watersports, training your balance can improve your postural control, important for any other sport or activity. I’d hazard a guess that if you want to strengthen your core and trunk muscles, heading out for a sunny paddle on a blue ocean is going to be far more enjoyable and fun than sitting on a Swiss ball in an artificially lit lounge. Not only can SUP increase your physical health in a number of ways, but research also indicates that getting out on the water can enhance your psychological wellbeing by nearly 20%. When evaluated, SUP has been found to improve energy and mobility and can help to reduce fatigue, discomfort and pain. It can also help to improve sleep, learning ability, memory and concentration and can also enhance a feeling of positivity. Generally, it can just make you feel good. 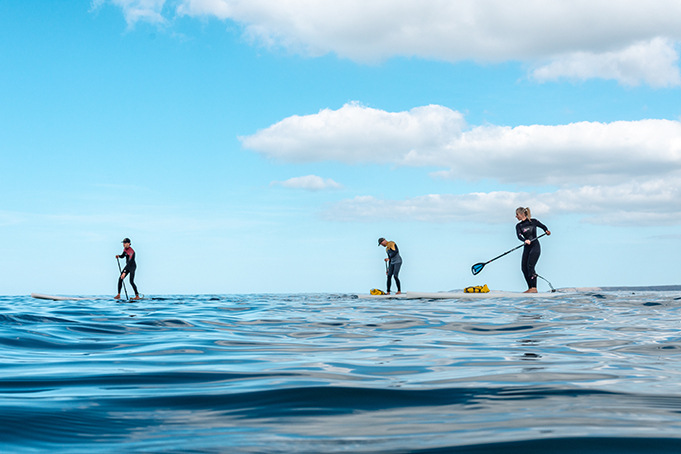 Due to its ability to improve and maintain aerobic and anaerobic fitness together with strength, SUP is a brilliant way to cross-train alongside any other sport. Due to its low impact nature it’s also a great way to minimise joint impact after injury. It’s essentially a great all-round sport for fitness. Anecdotally, a while ago I met someone who asked what sports I do. Upon mentioning SUP (alongside surfing, running and kitesurfing) he declared that irritating smug way that ‘he’d never seen the point of it’. He told me he’d done it ‘once’ and then moaned ‘never again’. It’s important to remember that comments like this come from a position of ignorance. I have a sneaky feeling he spent this summer land-locked, moaning about the forecast, getting more unfit each day. Maybe I should point him, alongside everybody else who fails to understand SUP, to this article. Not everybody has to paddle but by being a little more open minded it’s pretty easy to see that it’s a fun, wholly complimentary sport to all other sports you do. It can massively improve your health, fitness and performance for every other single sport out there. And it will guaranteed even improve your surfing.